Although there is something regal about riding atop an elephant, it didn't appeal to me, particularly when compared to a ram or big cat. 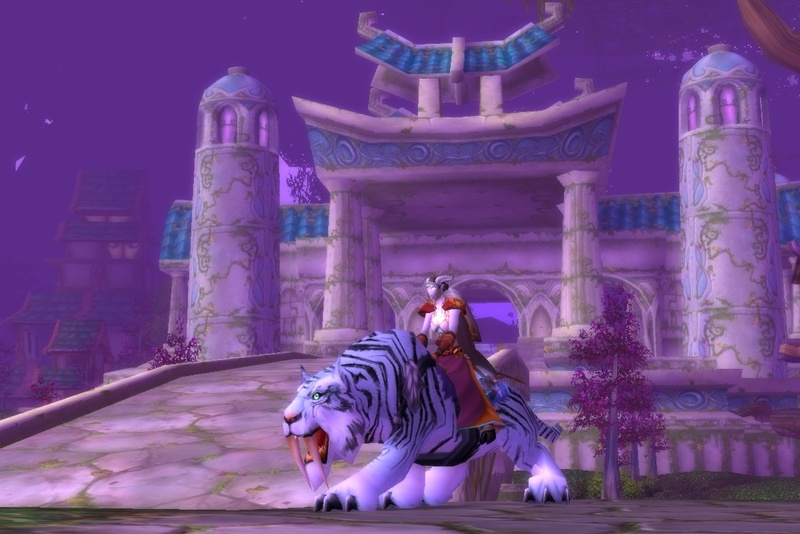 With my friend Knifey getting himself a pony and a ram, I decided to go for the big cat, which meant raising my reputation with Darnassus until I was exalted. This goal seemed possible and the best plan, with the lands of the Night Elf a short sail away, compared to having to travel to a different continent and brave many hazards before I was likely to meet many dwarfs or humans. And so I left the Exodar for Auberdine, the centre of peace in Darkshore, and introduced my self to the elves. It wasn't long before the elves had me cleaning up the wildlife of natural threats and sickly animals, as well as from more unnatural threats. It wasn't easy. Many of the beasts ran in fear when death was close, and with their four-pawed escapes I could not keep up, leading to annoying and frustrating chases that only either led me in to the maws of other animals or drew more angry animals to the aid of the one fleeing. The undulating landscape didn't help matters, as it often obscured a teddy bears' picnic of beasts from view, and gave me a continued crick in my neck as I had to constantly change from looking up to looking down. That the region was long and thin also made travelling tedious, with many journeys taking me the distance of the map, not like in other regions where there is a more central hub that lends itself to shorter, more frequent trips back to town. Working for the Night Elves was a slog, there's no doubt about it. My adventures took me through Darkshore and down to Ashenvale, before I headed back to help those in the tree of life, Darnassus itself, although I was careful not to do so at the same time as young adventurers were starting out and needed guidance more than myself. Venturing south from Ashenvale to Stonetalon Mountains gained me further favour with the elves, but still it wasn't enough and my patience for sparsely populated areas with few quests far apart was wearing thin. I decided to settle for riding an Elekk after all. I took an extended rest after adventuring for the elves, as it had taken its toll on me. By the time I was ready to return, the riding trainer at the Exodar had changed his policy and was happy to start giving riding lessons to younger adventurers than normal. Perhaps he realised how unlikely it is for someone who has roamed the land for months and faced many dangers to fall off a hulking Elekk that is trained to have a rider. Still short of being exalted with the elves I took him up on his offer and rode away on a purple Elekk, happy to save my aching feet from a lot of running. With a new mount and some rest behind me I was reinvigorated, and quickly rose in rank after questing in Stranglethorn Vale and Dustwallow Marsh. It was as I was getting more powerful that I remembered the Night Elf sanctuary of Feathermoon Stronghold, supposedly off the coast of Feralas. I had yet to travel there, but had been too lowly to get there safely. Now was the time to explore further. Indeed, the elves had a stronghold on the island, and there were emissaries requiring aid. I had matured enough to help them. I set off to find a missing courier, which took me to the coast where I avoided elementals that were stupidly powerful for the task in hand, before investigating some gnoll camps, and finally locating the courier in a disturbing insectoid hive. Whilst in the wilds I took care of an ogre problem and provided a leatherworker with some yeti hides. Although the leatherworker was from Stormwind he had a deal with the elves and his work rewarded me with Darnassus reputation. So it came to be that after a short while I was granted the wonderful sight of being bathed in a glowing green light with the approval of the elves, as I had finally become exalted with their faction. I thanked the elves of Feathermoon before rushing to the flight master to catch a hippogryph to Darnassus. Once there, my only concern was which big cat would choose me for a mount. I was soon the proud rider of a white tiger. This was a good moment. The Elekk is a good enough mount, but it doesn't fit in to many buildings, including banks, repair shops, and the Stormwind auction house, and even though it's not possible to ride in the buildings at least you could get in the door and then be forced to auto-dismount. With the Elekk I found myself constantly bumping in to the doorway and having to dismount manually, which got frustrating. A smaller mount doesn't have this problem. I also prefer the look of the saber mounts. An interesting aspect of getting a second mount is the cost. Quite a while back now, a second mount would have been quite the extravagance at 40th level or so, costing around 90 gold to buy with a faction discount. However, changes have been made that make far less of an obstacle. First, the cost of being able to ride has been shifted from the cost of the mount to the cost of the training. Once you can ride one mount you have the training to ride them all, so this was not a factor for a second mount. Second, the discounts offered by faction vendors have been increased. It used to be that becoming revered gained a 10% discount on goods, but now the discount starts at the honoured reputation level and continues up to a 20% discount at exalted. With the cost of the mount reduced this did not matter as much, but it is still nice. Third, as mounts are now available at 30th level the cost has been decreased accordingly, so they are now only 10 gold to buy. With my faction discount, and having already learnt the riding skill, my second mount only cost a bargain 8 gold! The big cat mount is fabulous, and almost worth the effort. I am not sure if I ever want to grind Darnassus reputation again though. Stormwind certainly seems to be the easiest faction to grind, and Ironforge isn't too bad, apart from having to visit Uldaman, but Darnassus seemed to be hard work. Maybe suffering from a little burnout with World of Warcraft made it that little bit harder. At least I finally have my kitty to show for my effort. This entry was posted on 19th August 2008 at 3.18 pm	and is filed under World of Warcraft. You can follow any responses to this entry through the RSS 2.0 feed. Both comments and pings are currently closed. damn, just about everything about this story sounds just like my character. im a dranei warrior and yes right from the start ive always wanted the cats thinking i can get any mounts i want when i reach 30 but no! i nearly cried, ive done all the obvious places and so i gave up till i reached 43 and stumbled on feathermoon. then i thought damn there may still be hope. and so now i am researching where else could there possibly be darnassus camps and thats how i found your story. im not sure if feathermoon will be enough but apparently theres also reapetable quests, so i am on my way back on track. congratulations on yours. i thought i was the only one.